Named after a style of song performed in Palestine, Lebanon and Syria, the word Dal’Ouna stands forthe communal values of synchronicity, collaborative work and mutual support required for a successful olive harvest, for building a home, or producing a life cycle event. This reflects the collective spirit of the ensemble, whose repertoire features instrumentals and poetic genres based in folklore spanning from Egypt to Andalusia via the Middle East, as well as original compositions—all enhanced by jazzy, layered improvisations, hints of other world traditions, and a profound sense of bluesy lyricism. The body of work developed by the ensemble presents (and represents) the group’s wide-ranging talents and diverse backgrounds, creative exchanges between the soloists, and the sensibility that in music, there are no borders. Ramzi founded Dal’Ouna in 2000, while living in Angers, thus laying the base for a Franco-Arab fusion band that also reflects Ramzi’s personal and musical voyage. 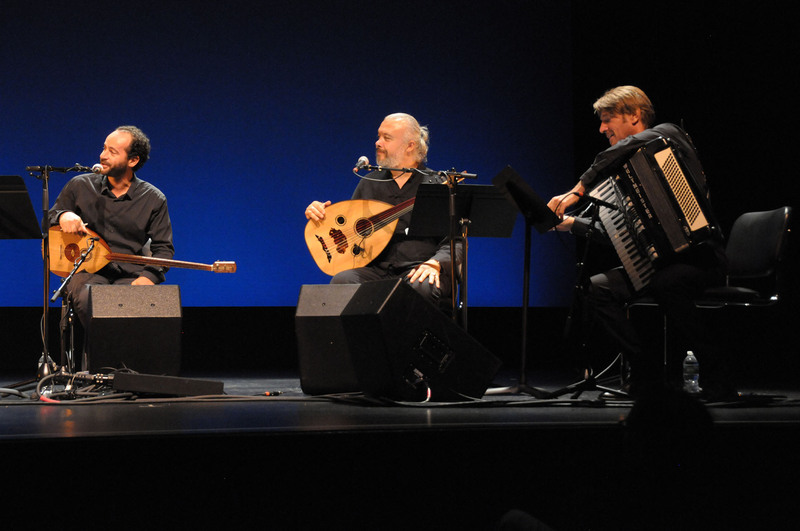 Dal’ouna’s core members include Ramzi on bouzouq and viola, Ziad Ben Youssef (Tunisia/France) on oud and percussion, Edwin Buger (ex-Yugoslavia/France) on accordion and keys, and Tareq Rentisi (Palestine) on percussion. The band has extensively toured in Europe, the Middle East, the Gulf countries and the United States. But it is in Palestine that the band tours most often, bringing its message to Palestinian cities, villages and refugee camps, and mentoring young performers who they invite to join their performances. The ensemble has released four albums to date. Dal’Ouna’s latest album (Reflections of Palestine, World Music Network 2012), featuring Ramzi’s compositions, was the winner of the 2012 Indie Acoustic Project (IAP) in the World Music category. The album explores and re-interprets a variety of traditional music genres from the Middle East. The title song of the album was penned by the revolutionary Egyptian singer- composer Shiekh Iman, whose collaborations with poet Fouad Najm in the 1950s-60s has rendered him beloved by millions and hated by the authorities. The album features genres ranging from Palestinian folklore to classical and popular oriental songs, along with the vocal powers of young talents Oday Al-Khatib and Noura Madi. World Music Network. A haunting instrumental album featuring Ramzi’s compositions and arrangements; it is a sonic travelogue of the worlds in which Ramzi has lived and evolved, and the magical, if seemingly inevitable, crossings between them. In this album Ramzi explores the bouzouq—an instrument brought to the Middle East by the Roma people and traditionally used for rhythmic accompaniment— as a melodic instrument with great capacity for nuanced subtlety and improvisation. -- In this truly remarkable album one finds the power of the Great Culture of the Mediterranean Basin. The beauty of the melodic lines, the infinite turns of the phrase and the extraordinary simplicity of the themes engrave themselves in the spirit of the listener... The continually shifting rhythms give the listener the sensation that times of old are incorporated into our own gait: sometimes calm like the desert after a storm, sometimes erupting like the tumults of life. This is a message for peace of a people who suffer silently, who are soft spoken, and who, through Ramzi and the other musicians, have taught me the importance of a profound humility that touches the deepest places of any heart that had the opportunity to hear them.